Gamblers placed bets at the Meadowlands Racetrack in New Jersey, one of a handful of states that have allowed sports betting. With Sunday’s kickoff, the New England Patriots start their first season in an era of dramatic expansion for US sports betting. But Massachusetts fans who want to put money on Tom Brady’s arm in the opener will still have to travel hundreds of miles to do it legally. A US Supreme Court decision in May struck down a federal law that barred states from legalizing sports betting, but lawmakers on Beacon Hill have not decided whether to allow it. Rhode Island will be the first New England state with legal sports betting when its two casinos launch sports books in mid-November. Only New Jersey, Delaware, Mississippi, and West Virginia have added sports betting in advance of the potentially lucrative National Football League season — joining Nevada, where it has long been legal. Pennsylvania could also jump in soon. Many other states, hungry for a new source of tax revenue, are eager to get in on a market that has long been dominated by illegal bookmakers and offshore websites. More than $100 billion per year is wagered illegally on sports in the United States, according to some estimates. But it may take several years for sports gaming to become widespread across the country. Lawmakers in Massachusetts and nationally are considering a host of policy questions, such as how to prevent problem gambling and whether the hasty implementation of betting could lead to corruption in sports. “I think once they sat down and started to think about writing a bill, they ran into some of the same thorny issues that you run into any time you talk about expanded gambling,” said Clyde W. Barrow, a professor at the University of Texas Rio Grande Valley who has followed gambling policy closely. A key question for states, especially those with casinos, has been whether to allow people to bet on sports online. The explosion in mobile phone use, combined with the increased availability of detailed, in-game data, has raised the possibility that customers might be able to wager from their living rooms not just on games, but on specific plays. 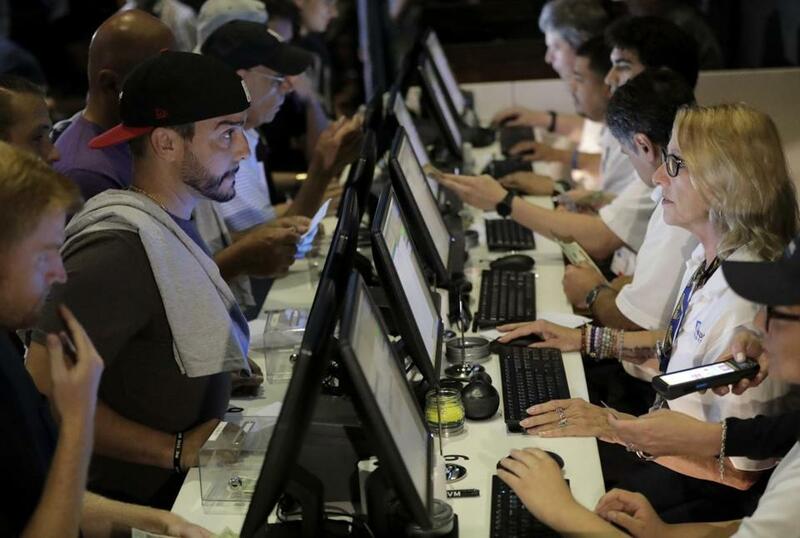 Some policy makers worry that minors would play illegally and that the exponential increases in betting opportunities could feed gambling addiction. Nevada and New Jersey, which both have casinos, now allow online betting, and West Virginia will follow soon. But gamblers have to actually be located within those states to place mobile sports bets. DraftKings, the Boston-based provider of daily fantasy sports games, was the first company to launch a mobile sports book in New Jersey. The company is well-connected on Beacon Hill from its recent fights to keep its paid fantasy sports games legal, and it will be urging lawmakers to open up a mobile gaming market here. If that happens, established gambling industry players, including casino and horse track operators, will also want a piece of the action. MGM Resorts, which just opened the state’s first full-service casino in Springfield, is a major presence in sports betting in Las Vegas, and it also recently launched online sports betting in New Jersey. The company also has key relationships in professional sports: The National Basketball Association has made MGM its “official gaming partner,” a designation that gives the casino company access to league data and branding. In a recent interview, MGM Resorts chief executive James J. Murren said he believes land-based casinos should play a key role in sports betting if it comes to Massachusetts. Sports organizations have been of two minds about the issue of gambling. The major athletic leagues long fought against legalization, worried that widespread wagering could raise the specter of match fixing, but sports betting also offers the prospect of increased revenue and fan interest. The NBA and Major League Baseball have held out the possibility of compromise if they are given the ability to monitor for corruption. Leagues have also asked lawmakers for a cut of the proceeds. The NFL is less comfortable with sports betting, although football remains the biggest draw for gamblers in Nevada. The Patriots and other individual teams have generally kept quiet on the issue, referring questions to the league. A recent report by ESPN, however, noted that Patriots owner Robert Kraft retains a small stake in DraftKings. The NFL and the National Collegiate Athletic Association have been the most vocal advocates among the major sports leagues for strong federal laws to control sports betting — though Congress has not yet moved on the issue. When all the maneuvering is done, though, industry observers have little doubt that there will be some form of sports betting in Massachusetts, and soon. An analysis of the US sports betting market by the research firm Eilers & Krejcik Gaming put Massachusetts among a group of states it expects to legalize sports betting by 2022. At that point, the company estimated that more than half of the US population will live in states where sports betting is legal. Massachusetts officials have been studying sports betting for some time. The state gaming commission issued a lengthy report in February that estimated expanded gambling could bring in $61.3 million annually if it were made widely available. Because the high court ruling came near the end of the Massachusetts legislative session, lawmakers decided to put off debating the issue until next year. The Legislature is expected to begin holding hearings on sports betting this fall. “Any time you combine sports and politics, especially in a sports-obsessed town like Boston, you’re going to get quite a lot of interest,” said Senator Eric P. Lesser, a Longmeadow Democrat who is a cochairman of the committee that generally oversees gambling bills. But he said lawmakers still have to address major questions, including how to protect the integrity of sports with new money on the line. “We’re talking about an entirely new phenomenon in the state,” Lesser said.